I just recently saw a few of the Adventure Time cartoons on DVD. It is a quirky little show that would not be my first pick. My first born son has gotten into this show. The more I see of it the less I like it. The Nintendo 3DS video game has been getting quite the push in recent months. Adventure Time Hey Ice King! Why'd you steal our garbage?!! reminds me of Zelda II The Adventure of Link. 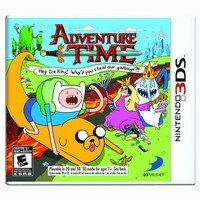 We have an overworld map like that game in Adventure Time Hey Ice King! Why'd you steal our garbage?!!. We also have areas we can go into. In those areas it is a side scrolling action adventure. Unless it is a town area, which has the same visuals. The 3D effects look okay in Adventure Time Hey Ice King! Why'd you steal our garbage?!!. There are some neat things done in some areas like Princess Bubblegum's castle. Expect a fair amount of violence as we dispose of odd looking creatures. To be technical everything in Adventure Time Hey Ice King! Why'd you steal our garbage?!! looks a bit off. The premise behind Adventure Time Hey Ice King! Why'd you steal our garbage?!! is the Ice King steals Jake and Finn's garbage. They go on a quest to find out why. I guess they want their garbage back. I won't spoil anything beyond that. It is interesting exploring this world and interacting with the various characters. The music in Adventure Time Hey Ice King! Why'd you steal our garbage?!! is fantastic. I love listening to the different tracks. The down side to this section is the crude humor. I was more than surprised by some of the things said in Adventure Time Hey Ice King! Why'd you steal our garbage?!!. In each area of Adventure Time Hey Ice King! Why'd you steal our garbage?!! we run into problems. We have to fight off the grass ogre and get the mail back, or free three prisoners who were wrongfully imprisoned. Things like that. There are areas not accessible until we learn a certain skill. There are numerous side quests that have to be performed before we can move the story along. As an adult I enjoyed Adventure Time Hey Ice King! Why'd you steal our garbage?!! on the Nintendo 3DS. The game is very engaging, and I loved helping out others. The crude humor and violence are not my thing. Although I found areas where I could actually avoid much of the violence. I believe it takes a better player to avoid conflict in games. The boss battles in Adventure Time Hey Ice King! Why'd you steal our garbage?!! are very different. I enjoyed figuring out how to beat them. Adventure Time Hey Ice King! Why'd you steal our garbage?!! is a little on the easy side, especially if the player is paying attention to the written dialogue. The little sound bytes in Adventure Time Hey Ice King! Why'd you steal our garbage?!! come directly from the show and are a nice touch. Enemies drop food items that are used to heal the main character in Adventure Time Hey Ice King! Why'd you steal our garbage?!!. Treasure chests can contain a variety of key items, or allow the player to increase a stat. Adventure Time Hey Ice King! Why'd you steal our garbage?!! includes a lot more than I was expecting. I appreciate the way it tips its hat to an older franchise. Fans of the show or fans of Zelda II will eat up Adventure Time Hey Ice King! Why'd you steal our garbage?!! from start to finish.